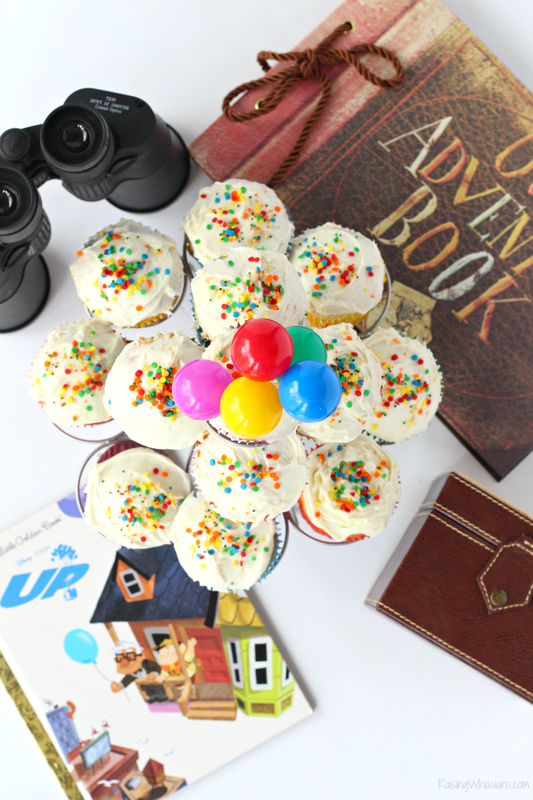 Things are looking UP with these Disney Up Party Ideas – grab your FREE party food, decor, kids activities & free printable to host your next Disney themed party! This post is sponsored by Disney as a part of the #DisneyKids Play Date campaign. All Disney loving opinions are my own. May contain commissioned links. Disney lovers, this is the party for you! 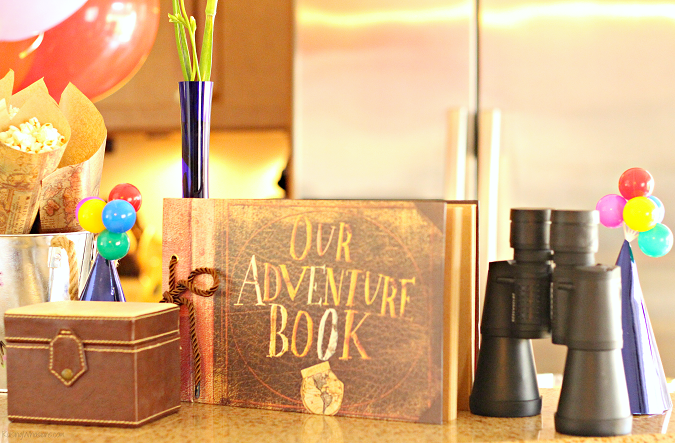 I’m so excited to reveal our Disney Up Party Ideas – from decor to food to drinks to free printable crafts and more! Perfect for a Disney themed party or playdate, I am just in LOVE with all of the fun we had with our kids at this Disney party. So grab your sense of adventure and come see all of the adorableness! EKKK! Can you tell that we’re a little excited for our party! I love the movie Disney Up; it’s one of our family favorites. So it was NO problem at all to host a party just for our movie. 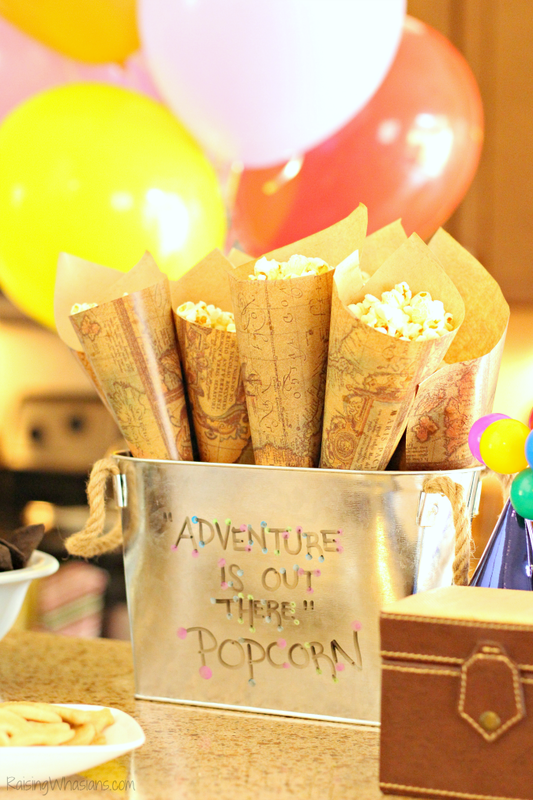 Disney Up Party Decor was hard to come by – I couldn’t find party supplies in a store. That’s ok. We were feeling “up” to the challenge. Balloons. A must-have for sure. I couldn’t resist the idea of having a huge bunch of balloons for this Disney Up Party. We saved a little bit of money on balloons by buying latex balloons in bulk and having them blown up at our local grocery store. 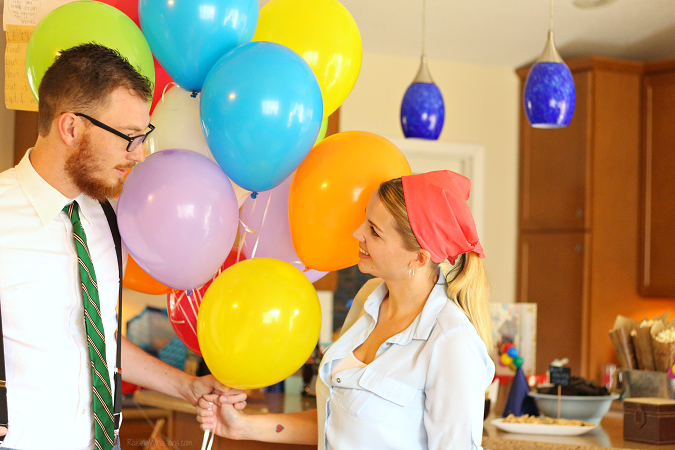 And they made the perfect prop for pictures – even Carl & Ellie stopped by our party. Carl & Ellie’s Our Adventure Book was also a must-have for our party. This heavyweight scrapbook was a great Amazon find, perfect for a Disney themed wedding or gift idea too! Be sure to use items around the home too! We used some binoculars, fresh flowers, and a few “vintage” looking pieces like this leather box. I just love adding to my kids’ Golden Books collection. 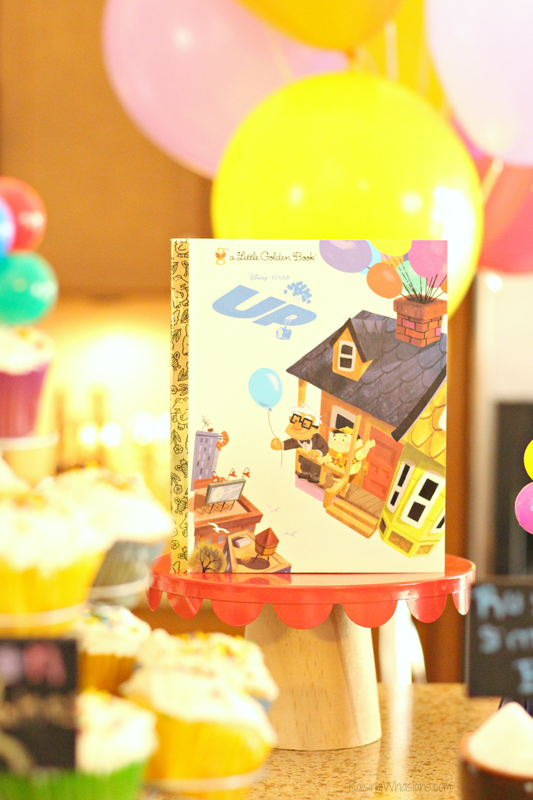 This Disney Up Golden Book was such a bargain and looked adorable displayed on a colorful stand for our party. Need a fun and easy Disney Up banner? 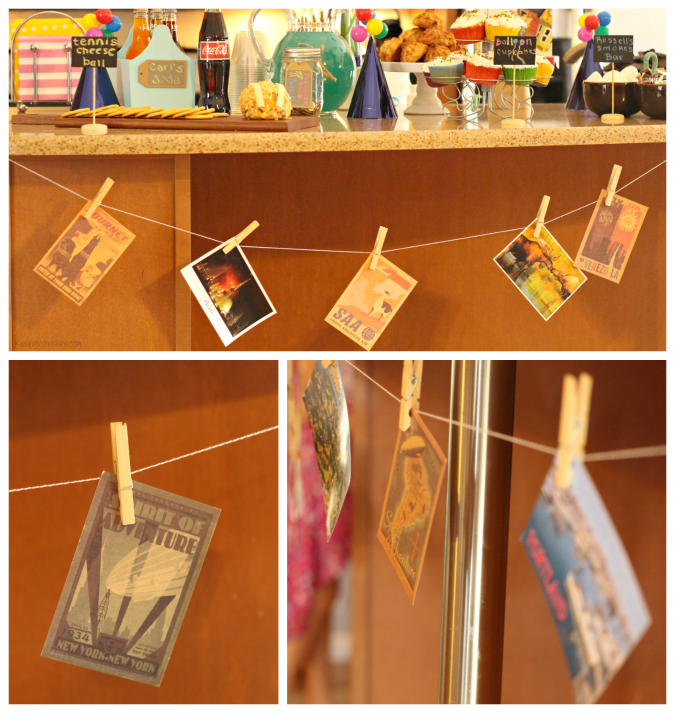 We took some vintage travel postcards and some postcards that our kids received from family members on their journeys and strung them up on some bakery string with clothespins. A super cute way to display your travels! Party hats, yes please! Disney provided these metallic blue party hats, which are pretty fun on their own…but I needed a little bit more. So I grabbed these balloon cupcake toppers and inserted into the tops of each hat. EASY! The kids loved wearing them too for a festive touch to our party. 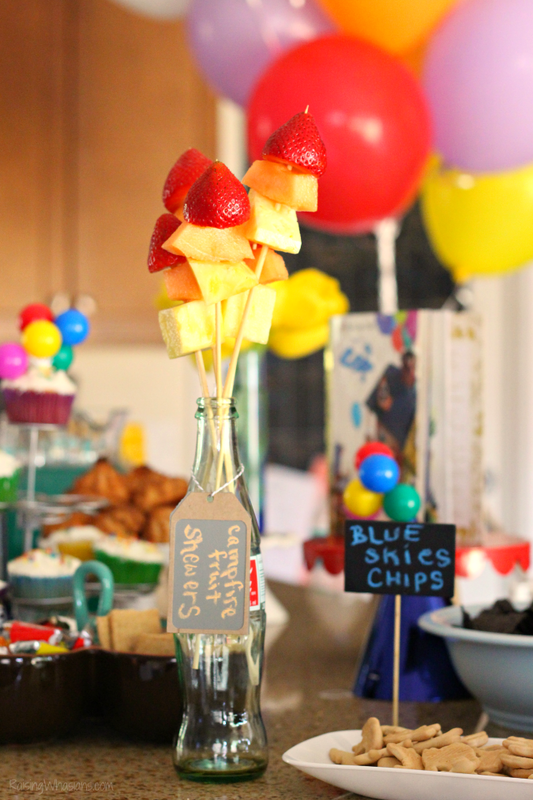 When running with an adorable Disney themed party, the themed party food must be spot-on! I couldn’t help but be overloaded with delicious Disney Up themed food. And I loved all of these cute ideas! 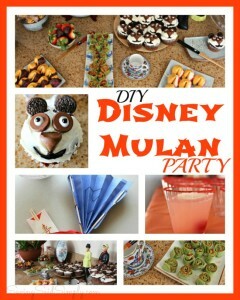 This has to be one of my favorite Disney party food ideas! The Adventure Is Out There Popcorn was such a hit with the kids, especially when we turned the movie on! I used this fun map printed wrapping paper, scissors and tape to create popcorn cones for the kids to hold. So fun! Up, up, up! 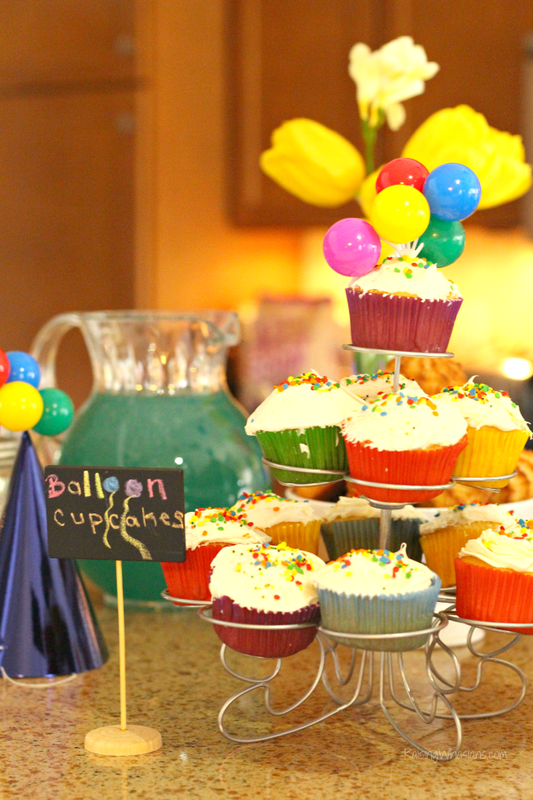 These balloon cupcakes kept lifting up and disappearing 🙂 Sprinkled with colored confetti sprinkles, I love the subtle nod to the Disney Up movie. And who can resist cupcakes at a party, seriously? 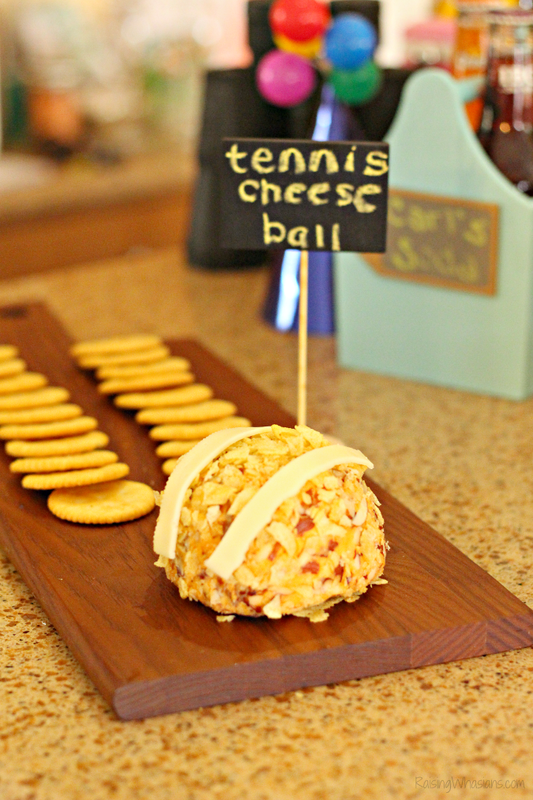 I rolled a store-bought cheeseball in some crushed potato chips for this tennis ball inspired cheeseball. Top with a few slices of white cheese slices for a fun take on Carl’s cane tennis balls! Wilderness Explorers love s’mores! 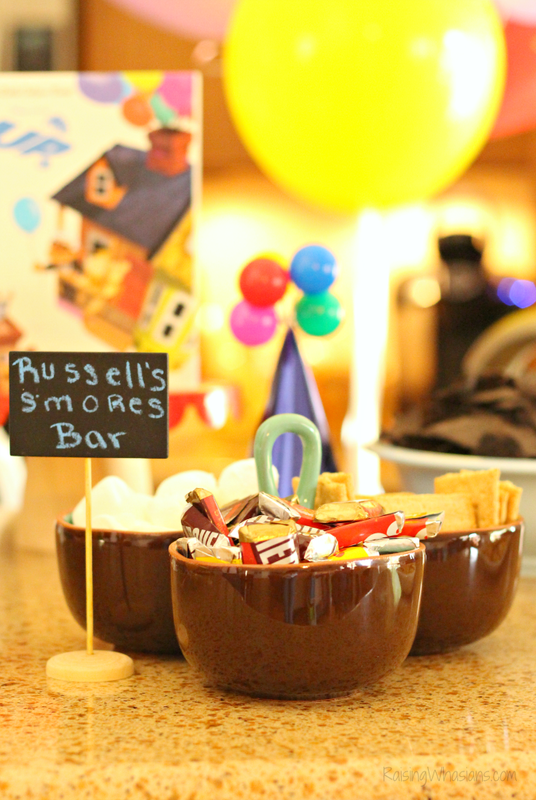 And that meant we needed to have all of the s’mores essentials at our Disney Up Party, including lots of chocolate to lure Kevin & her babies to our party. Here, Snipey Snipe! 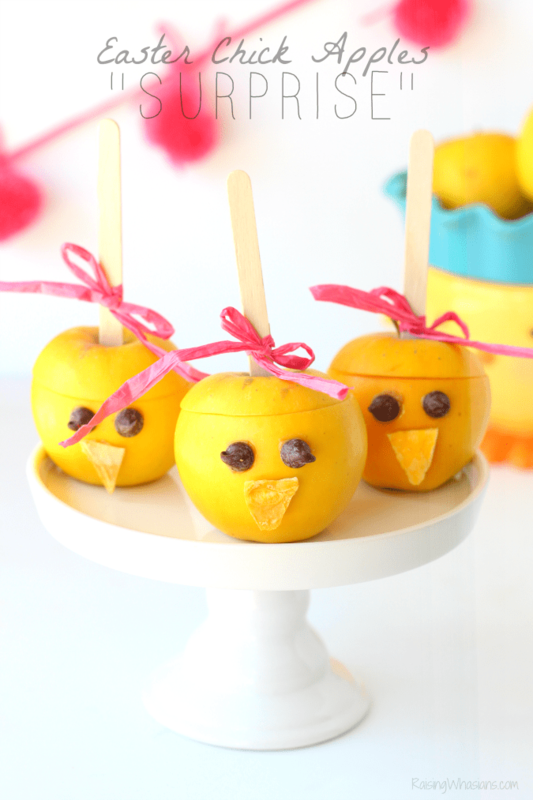 Singing around the campfire wouldn’t be the same without these campfire inspired fruit skewers! Featuring the colors of fire, these were a huge hit with our kids! Blue skies are coming our way! 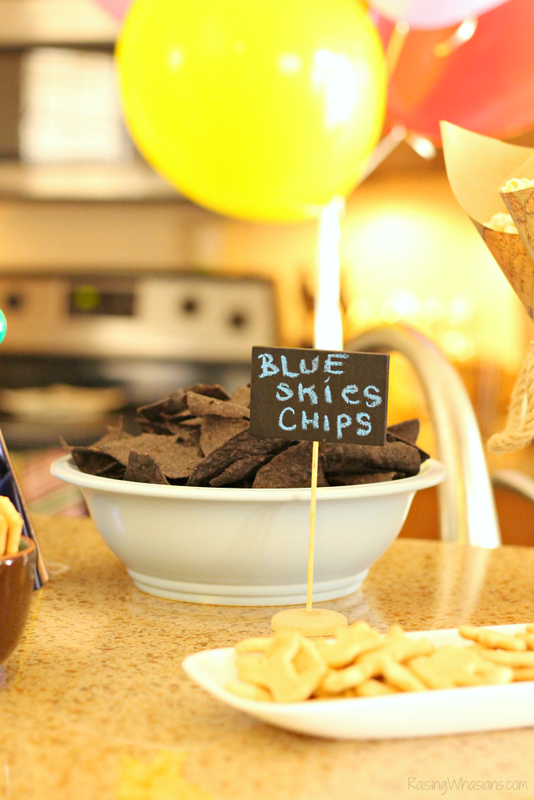 These Blue Corn Tortilla Chips had us thinking about clear skies, perfect for balloon travels! All of that world traveling would definitely make me thirsty! Quench your party guests’ thirst with these themed Disney Up Drink Ideas. Pop, y’all! Soda pop in glass bottles were definitely needed for our party. I mean, we had to earn our Ellie Grape Soda badges, right? And while I couldn’t find any grape soda at the store (highly disappointing), I did find lots of fun colored soda at our grocery store. I placed a few in this wooden garden caddy for a vintage look. And don’t forget the “Carl’s Soda” label. This had to be one of my favorite ideas. Paradise Falls Punch! 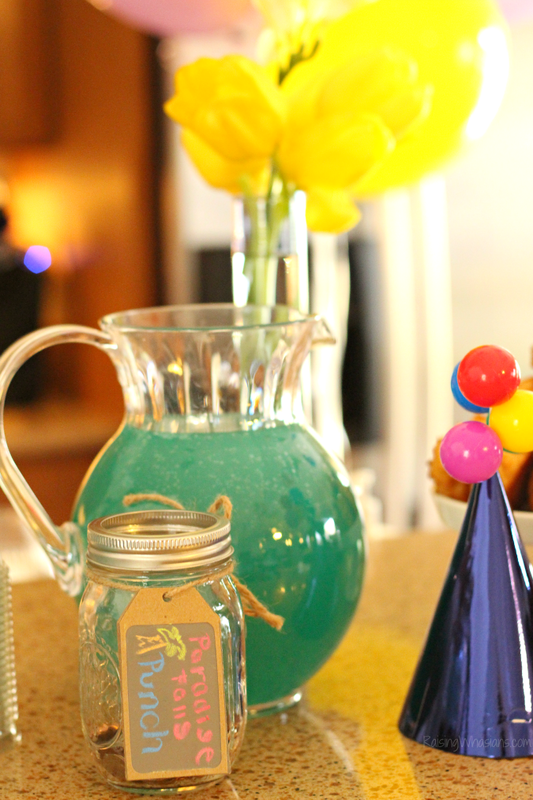 Make this easy punch with a little blue Hawaiian punch. 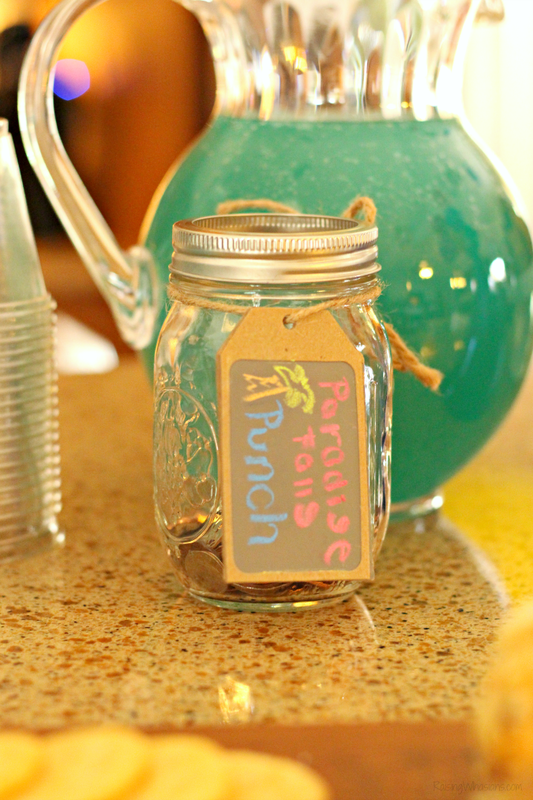 Grab a mason jar and fill with a few coins. Be sure to tie your “Paradise Falls Punch” label around it. It’s not a party without the fun kids activities! Disney Pixar Up movie was on repeat during the party (can’t get enough of Carl, Russell, Doug & Kevin!) so everyone had a chance to eat their popcorn and watch our Disney theme in action! The Disney Up Party Ideas don’t stop there. 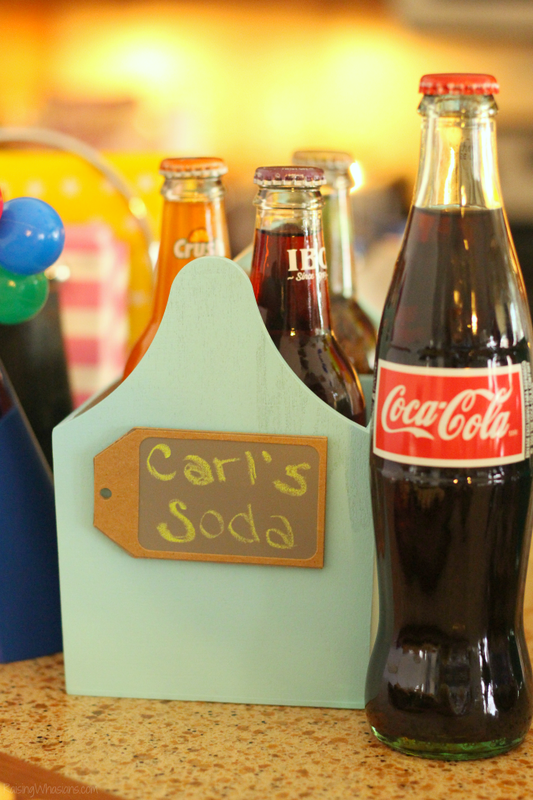 This crafty mom must always have a craft on-hand for our kids (and adults, I don’t judge). 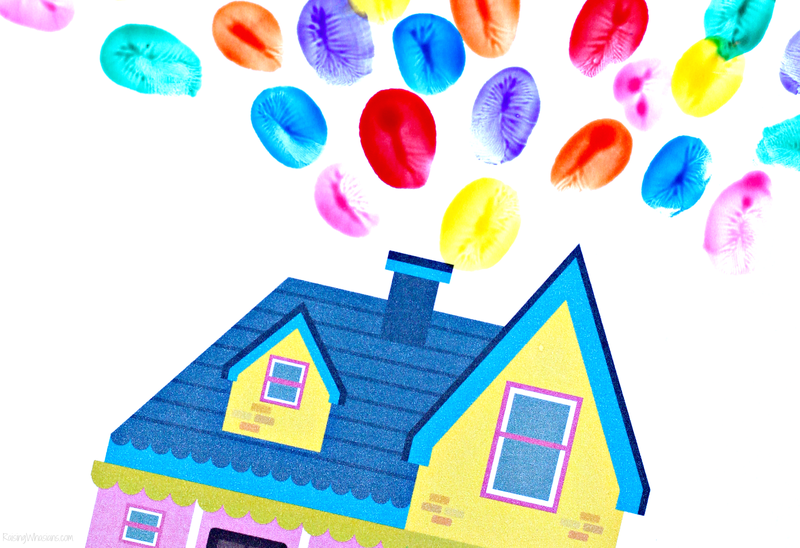 So we had our painting skills ready with FREE Disney Up Printable featuring Carl’s colorful house so we could fingerpaint our own balloons! Oh my goodness the kids had so much fun painting their own bunches of balloons, and the results were perfect for framing! I love a great frame-worthy craft, especially when it features my kids cute little digits! Whew! We were “blown away” by all of the adventure we had at our Disney Up Party. 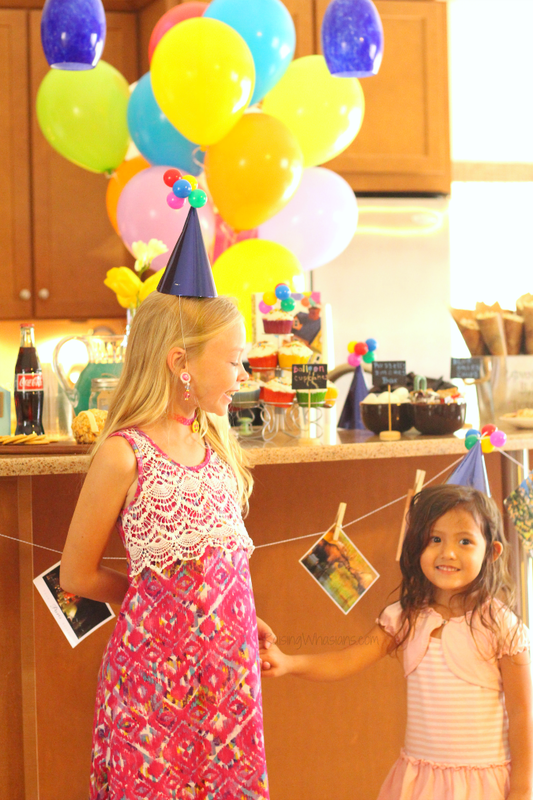 Hopefully you grabbed some of your own fun Disney Up Party Ideas. Be sure to pin and share with your Disney loving families so you can start planning your next Disney themed party or play date! 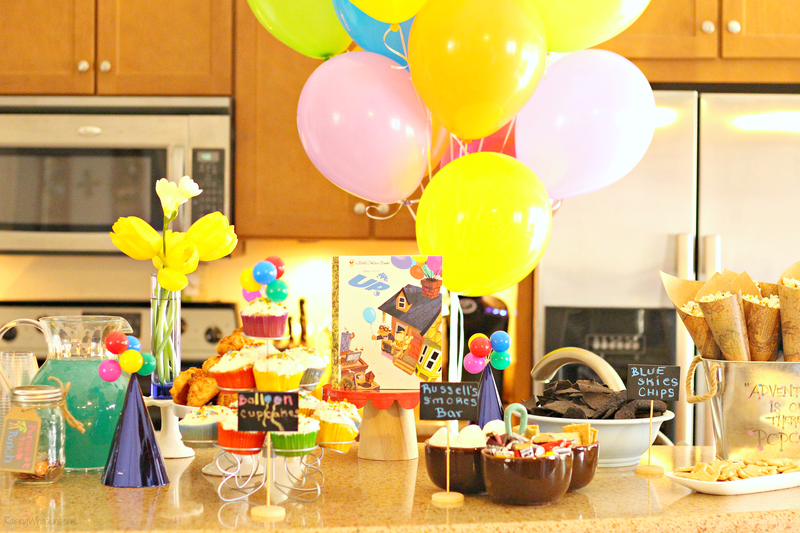 What is your favorite party of our Disney Up Party? Would you throw one of your own? What a super-fun Party! I lhe the fun food with reference to the movie. The postcard banner and huge balloon bouquet are awesome, too! So many fun ideas here! My kids are older now so I can’t do any of this. Wish I could though…because it is so clever! We have a couple of Disney parties when my boys were young. 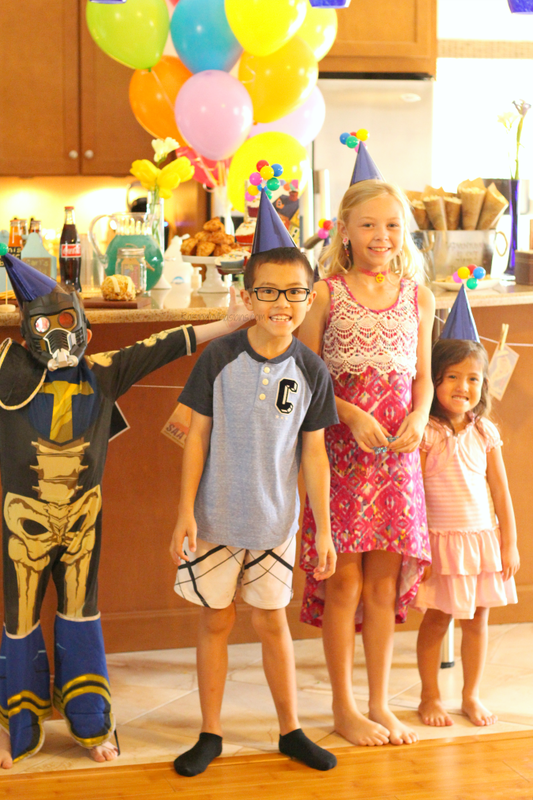 It is always a great party theme! You are amazing! I cannot believe the job you did. Our Adventure Book is absolutely spot on. Wonderful! Oh wow. You are giving me some serious mom insecurity! LOL. I’m just kidding, but seriously, you did an absolutely amazing job. Up was such a cute movie. These are great ideas for a Disney Up Themed party! Aww, Up was a great choice of theme. I love these decorations! Your snacks were definitely perfect for it too. I love the movie and it’s awesome to be able to host a kids’ party that has that theme! These are cool details! Love the ideas! Up is one of my Disney favorites and you really touched on so many awesome details! That adorable fingerpaint craft idea seems especially fun. What a great party that was! I loved all your decorations and the cupcakes looked so yummy! Oh your skirt is so cute! 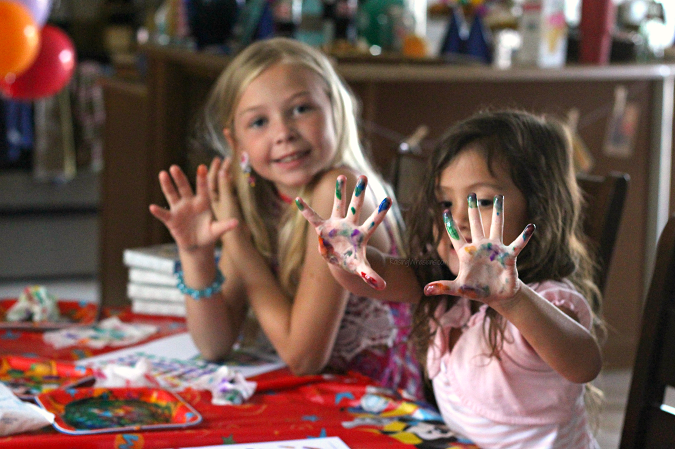 And the fingerprint craft sure gave the kids a great time. Wow, this looks like an excellent reference article for throwing a good time. 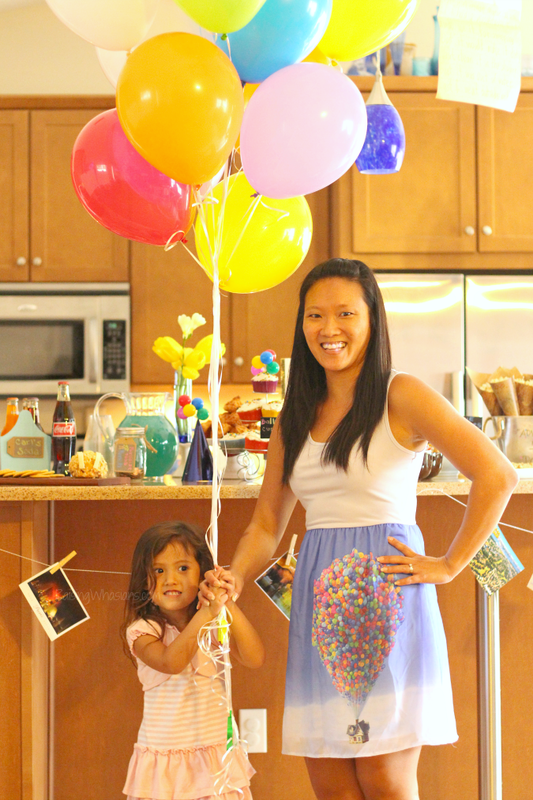 My sister-in-law absolutely loves to throw theme parties – I will share this with her. looks like such a great party! my daughter loves the movie up. I thought UP was a cute movie. I kinda felt bad for the old man. He was just missing his wife, that’s all. These party ideas are very cute though. So fun!!! I just love these fun ideas! Looks like a fun party! I miss having kid themed parties. You came up with neat ideas that I can use! I love Up. What a fun party idea! Plenty to keep the kids entertained…I will definitely use the printables to keep the kids preoccupied. I never saw the movie UP!, but I sure do now!! I would also like to attend one of your Disney themed parties!! It seems like you didn’t leave anything out. The kids would not be bored that’s for sure!! I love how your kids are involved also! They have smiles on their faces & I betcha every friend and classmate will be anxiously waiting for the next party invitations. I shared so other families can have the same kind of fun and awesome memories!! Thank you for sharing!! What a cute party! The printables are going to be fun. These are great ideas! I will be sharing this with my sister so she can use them for her oldest daughters birthday. This is such a cute party idea and I might just have to use it for my daughter’s birthday that’s coming up! My son is a BIG Disney lover. these are all awesome tips for his coming 5th birthday party!! !